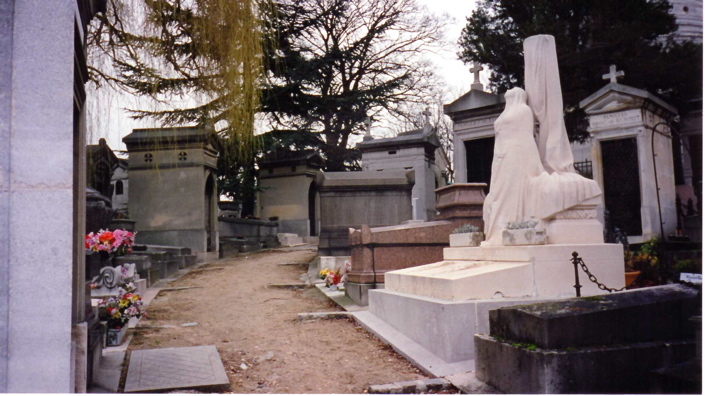 On Ash Wednesday, 25 Fevrier 1998, I started with a bit of memento mori by visiting Le Cimetière du Père-Lachaise. This “city of the dead” is the final resting place of numerous illuminaries such as Sarah Berndhart, Frederic Chopin, Jacque-Louis David, Isadora Duncan, Edith Piaf, Marcel Proust, Georges-Pierre Seurat, Alice B. Toklas, Gertrude Stein, Oscar Wilde, Richard Wright, and Jim Morrison. It’s ghoulishy cool place to take a stroll. Year’s later I would read a great book called Waiting for Gertrude by Bill Richardson in which all the people buried in Père-Lachaise are reincarnated as cats. I returned to Norte Dame, this time to worship. The cathedral was quite crowded and a security guard valiantly tried to keep camera-toting tourists out of the choir. I had no idea how to tell him in French that I was here to pray, so I made a sign of the cross on my forehead, and he let me in with a smile. I received the actual ashes on my forehead a little later during a lovely Mass where I sat next to a French woman with an amazing singing voice. Not knowing the language, I really couldn’t sing myself. 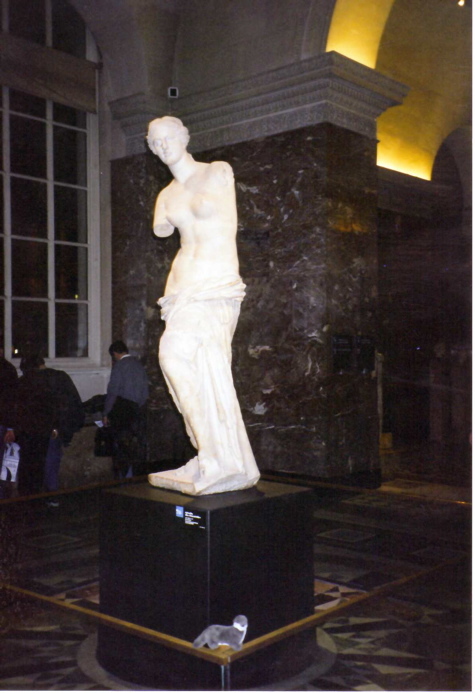 On Wednesday, the Louvre Museum was open to 10 pm, and anyone arriving after 2 pm got in for reduced admission. I figured 8 hours was a good amount of time to take in the world’s greatest art museum so I joined the snake-like queue leading into Pei’s glass pyramid. The line was long but moved fast and soon I was inside and overwhelmed by choices. I bought an English-language guide for first time visitors that described and guided me to the 51 top masterworks in the collection. Following that took me about four hours and was well worth it to see all the famous art works I’d heard of (as well as many I never heard of but liked anyway). AMERICAN MAN: What makes it so famous? After being around so many Australian travelers, I was amazed by how many fellow Americans were in Paris. Luckily I had my English-language guide so I could tell the woman from Michigan that David’s Le sacre de Napoléon depicts the Emperor’s coronation, not his sacrifice. I admired a lot of art, but settled on the following three paintings as my favorites: La belle jardinière by Raphael (I especially like that John the Baptist wore a hairshirt as a baby), La Jeune Martyre by Paul Delaroche, and the drool-worthy Woman with a Mirror by Titian. After a full day’s work looking at art, I was bleary-eyed and staggering through the gallery. I took the Metro back to the hotel and dreamt of curvy, curly-haired women with mirrors. An “avenue” in the City of the Dead. 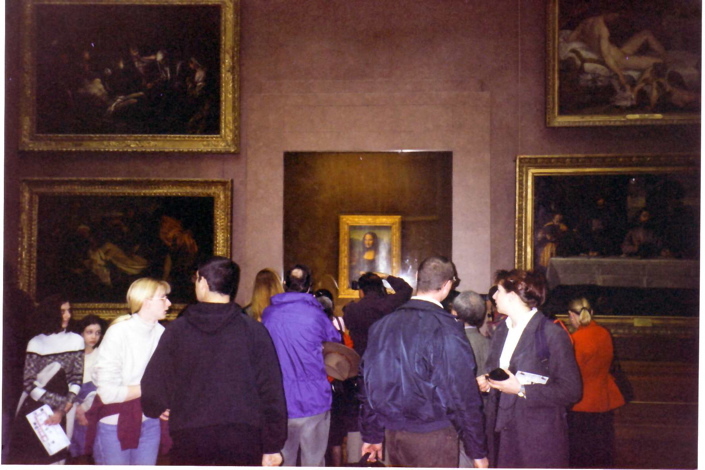 If you go to the Louvre to see the Mona Lisa, expect company. Venus de Milo and Newport Otter enjoyed one another’s company because they both understand what life is like with stubby arms.